The companies which participated in previous job fairs are expected to provide the CSO with a statistical report of all recruited USEK students/graduates through the previous job fair. All valuable and important belongings, furniture, equipment should not be left unattended at the stand on April 16, 2019. Transportation of all materials to/from the Job Fair is the sole responsibility of the company representatives attending the event. You may set up the materials one day prior to the event - uninstall the following day. Interested participating companies may visit the Job Fair site one day prior to the event to check their booth location. USEK maintenance team will be available to assist you in moving your materials from/to the vehicle in the parking lot. 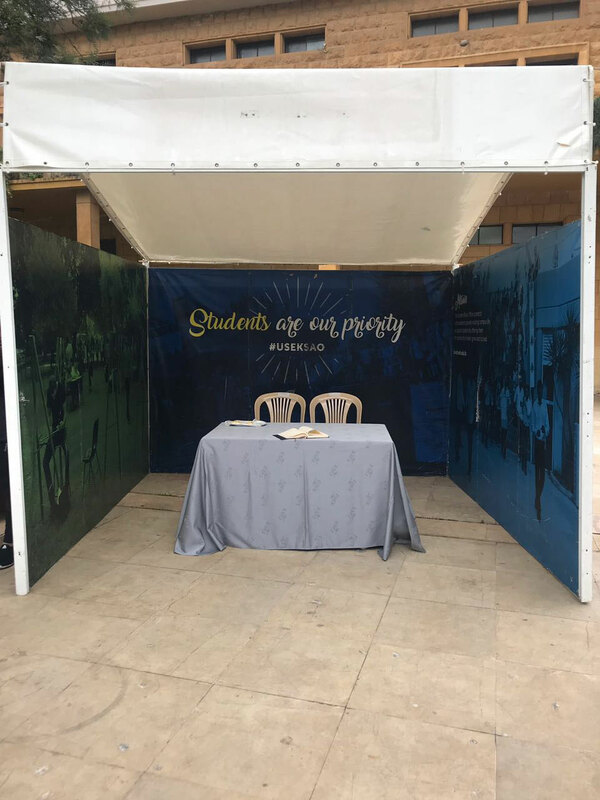 USEK is not responsible for the loss or damage of unattended belongings during the event. If you must cancel your booking for unforeseen circumstances, please send a cancellation note by return email, no later than March 27, 2019. USEK reserves the right to close the registration before the set deadline, should the floor plan be fully booked. Participation fees are to be paid by March 27, 2019. Companies that have not settled the payment by the due date, will not be eligible to participate. No refund policy is applicable. Your participation fees are non-refundable unless USEK cancels the Job Fair due to natural, political or any unforeseen circumstances. Panels per cubicle: 2 or 3 depending whether its inline or corner.